Target 4.b, focusing on specific countries, does not appear consistent with a universal agenda. Like all the targets, it aspires to reduce inequality between countries, but it could exacerbate inequality within countries because scholarship beneficiaries tend to have advantaged backgrounds. In addition, many scholarship recipients do not return to their countries. This would suggest that scholarships tend to support the higher education institutions of richer countries instead of benefiting poorer ones. The formulation of target 4.b is lacking in several respects. It is recommended that scholarships be counted as eligible only if they refer to study at higher education institutions in countries other than students’ home countries and are at least partly publicly funded. The outbound mobility ratio, i.e. the number of students from a country studying abroad, expressed as a percentage of total tertiary enrolment in that country, is 1.8% for developing countries. However, in some countries, notably among small island developing states, it is considerably higher. In Saint Lucia, five nationals study abroad for every ten students in the country. Surprisingly, there is no consolidated global evidence on scholarship numbers, let alone recipients’ nationalities or fields of study. Information collected for the GEM Report from 54 government scholarship programmes indicates that some 22,500 scholarships were offered in 2015, corresponding to 1% of the number of mobile students from low and lower middle income countries. A global mechanism for monitoring scholarships is needed to report on indicators such as number of scholarships awarded, number of scholarship years awarded, number of recipients who complete their studies and number of recipients who return home. Aid data can give partial information on scholarship programmes. 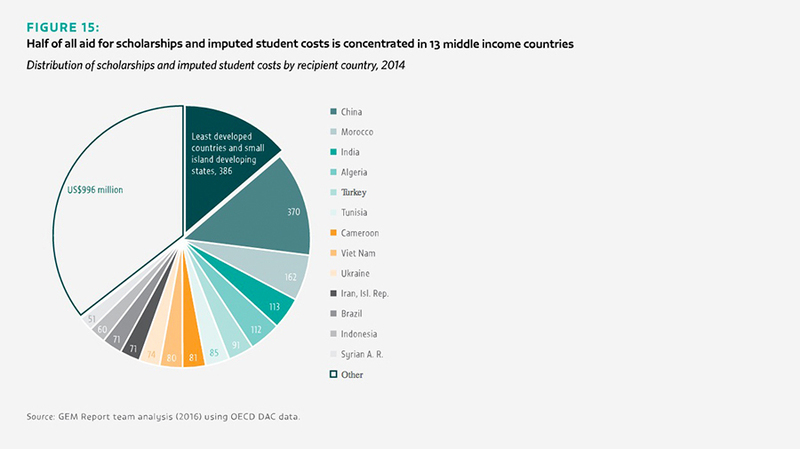 In 2014, US$2.8 billion of aid was allocated to scholarships and imputed student costs. Of this, US$386 million was directed to least developed countries and small island developing states.